Generic Idea: Chocolates… Better Idea: Instead of just picking up a box of Russell Stover’s, buy several boxes until you can fill one of them with just the chocolates that taste like toothpaste (assuming that’s her favorite). Generic Idea: Movie Night… Better Idea: Instead of going out, try to recreate the theater at home. Pick up some sour patch kids and huge Cokes from the gas station; break out the lawn chairs with the cupholders; pop some popcorn; and turn the volume up unreasonably loud. Generic Idea: Spa Day… Better Idea: A gift certificate is nice, but what if your house was the spa! Don’t have a bathtub? No problem. 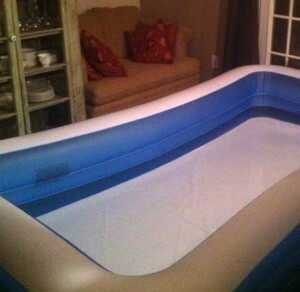 Run to Target and pick up a kiddy pool. What? They don’t have a bathtub sized one? Get the one that holds 12 people. Oh, it needs 220 gallons of water? No problem, that’s only 44 trips with a bucket. Hot water heater can’t handle it? That’s what the tea kettle is for. You’re worried the floor might cave in? Don’t be. You’re all set! Did Businessmen Drink At Work In The 60’s?